:This book offers an account of the moral foundations of pastoral ethics and the underlying interpersonal dynamics that make the practice of ministry powerful--and also morally dangerous, even for those with the best of intentions. Sondra Wheeler examines the personal disciplines and spiritual practices that help sustain safe ministry, including the essential practices of prayer and spiritual accountability. She equips ministers to abide by ethical standards when they come under pressure and offers practical strategies for navigating challenges. The author also stresses personal vulnerability and "unselfish self-care." 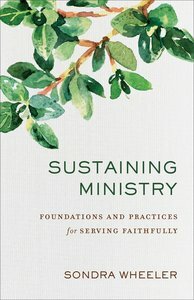 About "Sustaining Ministry: Foundations and Practices For Serving Faithfully"
Sondra Wheeler is Martha Ashby Carr Professor of Christian Ethics and teaches bioethics, the history of theological ethics, and the virtue tradition as well as biblical ethics at Wesley Theological Seminary. She is a respected scholar and speaker.